IES regularly designs, installs and supports technologies used in Command, Operation, Network Control and Traffic Management Centers. The emergence of global access to systems makes it imperative that centers of today and into the future afford this accessibility. Information from a variety of sources such as desktop computers, tablets, laptops, media players, video conferencing and surveillance cameras are now the norm. The sources in the center can then be displayed using a variety of technology including projectors, flat panel displays, laptops, tablets and more. These technologies allow for collaboration with the center and authorities, other operation centers, as well as the general public via streaming video. Video walls, operator consoles and sound are some of the items that are found in most centers. In responding to an RFP for a municipality, IES proposed and designed a comprehensive audio visual system to meet the demanding needs of an Emergency Operation Center for a large municipality. 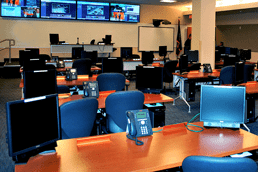 Emergency Operation Center (EOC) systems must be designed with the functionality in mind for a municipality’s response to a public safety incident. These centers may remain functional for weeks at a time, for multiple agencies on a 24/7 basis. 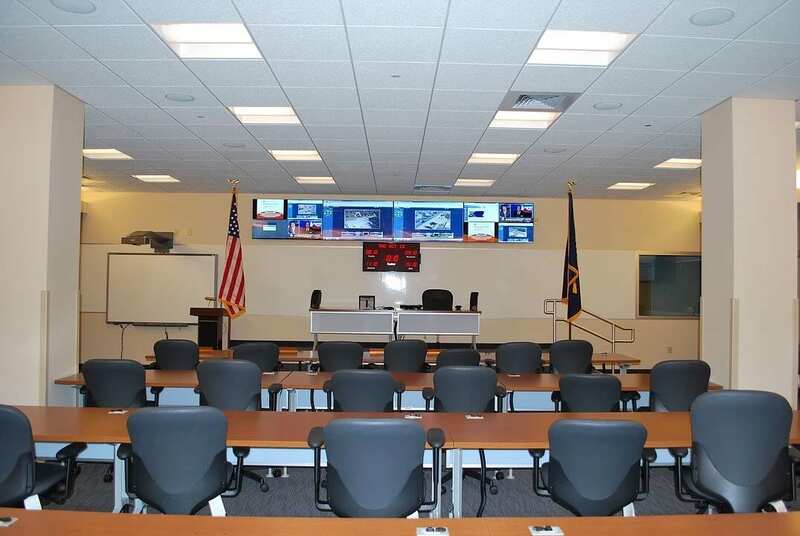 The IES design included multiple video display walls in the EOC. Data sources for the system included local PC applications, remote network applications, remote network streams, compressed network video streams, television tuner sources, VGA, and DVI inputs. With a central video wall controller, IES integrated a control system to various government facilities to control sources and displays for a given agency. The EOC System gave the user the ability to view and hear multiple video events spanned across multiple flat panel LCD displays. A video distribution system was installed throughout various offices for agency heads to select and view information related to their departments. Additionally, a Unified Command Center (UCC) was installed to support the added logistics of agencies on the state and federal levels. When not in use, the UCC can also be used as a training center for the municipality to use for disaster responses. Both the EOC and UCC are controlled via easy to understand and operate graphical user interfaces. IES has been involved in a project to improve the video wall controls for a major combined traffic management/911/police operations center. The Center needed to have the signals upgraded to digital to match the camera inputs being sent to the video wall in the center. We designed a modular control system that utilizes the existing display devices in the main center while also providing a second video wall on the second floor with independent controls of the same cameras. The system design meets and solves the immediate needs and also provides for future expansion of the system without having to change the head end systems. 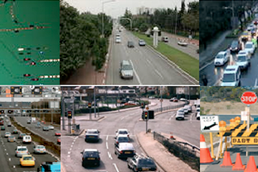 IES began their relationship with a State Department of Transportation with a charge to create an extensive, yet flexible, observation system that would track traffic patterns on major streets, roads and highways throughout the State. 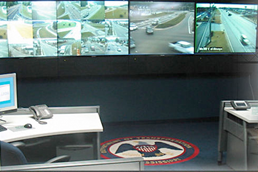 Working with the client to determine specific needs, a system was developed that incorporated input and live feeds from cameras on roadways throughout the state and brought them into a centralized operations center. The center was fitted with a 1×4 video wall of tracking monitors. IES developed a secure, remote access point to adjust camera views and alert police and/or emergency response teams as necessary. The operation center has been functioning flawlessly since its inception and has developed into a statewide expansion of the system to assist in live traffic control, emergency response and appropriate re-routing. This statewide system allows nearly instant response to needs especially as the roads become inundated with travelers during evacuation situations.